We will accomplish this through the use of virtual hosts. This guide will use an Ubuntu 12.04 VPS server, but other distributions should function in a similar way.. 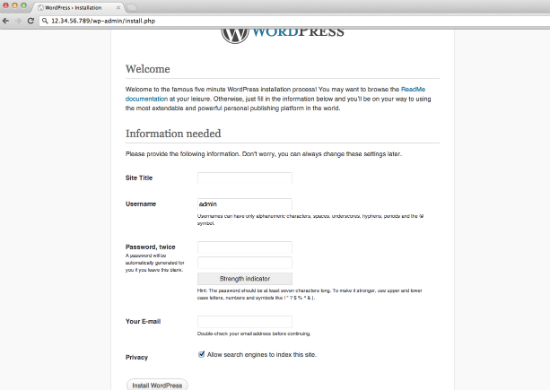 Create a new DigitalOcean VPS to host your WordPress sites. Complete the initial server configuration by following this guide. Set up two domain names with DigitalOcean. Use this guide to learn how to set up domain names with DigitalOcean. Install a LAMP stack on Ubuntu using this guide. At this point, you should have LAMP installed on Ubuntu and both of your domain names should be pointing to your droplet. If your domains do not lead to this page, then either you need to wait for the DNS changes to propagate, or you have misconfigured something in the previous steps. Do not continue until this is resolved. Before we continue, we need to configure an independent database and user for each site within MySQL. This will ensure that the site data is separate. The table above is provided to give you context for the commands we will be using. Substitute your own information when you are filling out the commands that follow. You will be prompted for the MySQL root password and then you will be dropped into a MySQL prompt. We will be installing both of the sites within individual directories in the web root of our server. We will configure each site with the information about our sites. Find the same section you edited for the previous site. You will be entering information for the second site this time. We need to configure Apache to direct traffic from each domain to their respective directories. We will do this by creating separate virtual host files for each domain. If you need to enable pretty permalinks, you can change the "AllowOverride None" within the "<Directory /var/www/FirstSite>" block to "AllowOverride All". You can learn more about the requirements for pretty permalinks here. After making the changes, save and close the file. There are a few more steps necessary to get our sites working. In order to see your new WordPress sites, simply navigate to your domain names in a web browser. You can now log in and configure each site independently. These sites are completely separate and can be administered as if they exist on two entirely different VPS servers.